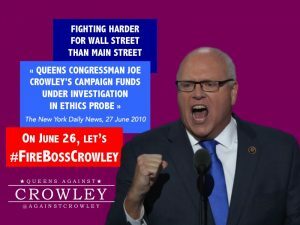 How it came to be that U.S. Rep. Joseph Crowley (Establishment-NY) came to hold so much political power and Boss of the Queens Machine is a cautionary tale about the corrupt misuse of power by the chair of the Democratic Party county committee in Queens. Crowley was a career incumbent New York State Assemblymember (think “Albany“) when U.S. Rep. Thomas Manton decided, in 1998, to retire from the U.S. Congress. In order to facilitate an undemocratic transfer of power between political insiders, U.S. Rep. Manton waited until after the deadline had passed for individuals to register to run for that year’s Democratic Party primary for Manton’s Congressional seat. Because Manton was Queens Democratic Party committee chair, he basically “installed” Crowley in his stead as the beneficiary of the ballot petitions collected by his campaign committee. 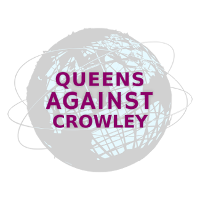 Because Crowley ran unopposed, he was guaranteed to win that year’s Democratic Party primary and, in a City with a supermajority of Democrats, that is how Crowley went to Washington to represent Queens and the Bronx. In the twenty years that Crowley has now been in the U.S. Congress and in the twelve years he has been chair of Queens Democrats, he has ascended to become chair of the House Democratic Conference. Word amongst lobbyists is that Crowley is within reach of becoming Speaker of the U.S. House of Representatives should the establishment Democrats take back control of the House. As voters go to the polls on June 26 for the Democratic Party primary and as Democrats actually consider Crowley for House Speaker, let’s look back at how Queens Democratic Party leaders have used their power. Donald Manes was the long-time chair of the Queens Democratic Party county committee when a slow-moving corruption scandal caught up with him. A controversy at the New York City Parking Violations Bureau revealed that Manes was receiving kickbacks. The granting of cable television franchise licenses also came to be under investigation. Essentially, the making of political appointments and the granting of official acts had been turned into a money-making operation. When the press began tracing figures in the corruption investigation back to Manes, Manes sensed that the jig was up. He had already made one suicide attempt and had resigned the Queens Borough Presidency and the Queens Democratic Party county committee leadership post before finally taking his life in 1986. After the dust settled over Manes’ suicide, Manton was selected as the new chair of the Queens Democrats. In Brooklyn, the county chair, Meade Esposito, was eventually found guilty of corruption. Under Manton, the Queens Democratic Party county committee remained a powerful political machine. The county committee was able to parlay electoral endorsement as a pretext to provide assistance to preferred candidates. It was also able to mount legal proceedings to disregard the ballot petitions of insurgent political challengers as a way to protect the safe election or reëlection of party insiders, according to a curosry look-back at Manton’s time as county chair published by the New York Times. When Manton was ready to retire, he engineered his replacement in the House with Crowley, angering some Queens Democrats, who still naively believed that political party primaries were the vehicle that should determine office-holders, not insider transfers of power. Before his death, one of Manton’s most important installations of power was the selection of Christine Quinn as speaker of the New York City Council. A political protégé of Wall Street billionaire Michael Bloomberg, Quinn controlled the votes on the New York City Council legislation by using a slush fund as the source of discretionary funding for Councilmembers and the extension of term limits to keep incumbents, like Mayor Bloomberg, in office. Before the decade was out, Crowley kept Quinn as Council speaker, despite her neoliberalism and her undemocratic exertion of power over her fellow Councilmembers. Some of the preffered officials being supported by the county committee in that time of Manton’s death included then New York State Assemblymember José Peralta. In Brooklyn, the county chair, Clarence Norman, was convicted of corruption charges. As corruption began to be investigated across New York State by each of the U.S. Attorneys’ Offices in New York City, several Queens officials were arrested, indicted, and found guilty — some of them incumbents, who had enjoyed support by the county committee chaired by Crowley : Hiram Monserrate, Jia Hou, Albert Baldeo, Malcom Smith, Daniel Halloran, and Vincent Tabone. Other Queens Democrats, who have become subject to regulatory or prosecutorial action, have included John Liu, Shirley Huntley, and Ruben Wills. 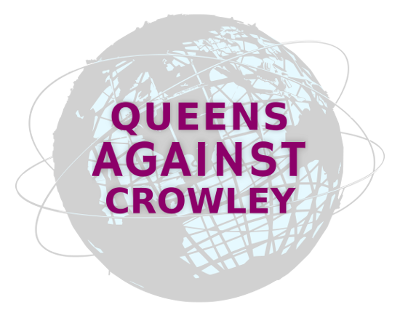 Despite this horrifying record of corruption, Crowley remained silent about the corruption eating away at the political center of Queens Democrats. In the wake of the 2016 Democratic Party presidential primary in New York State, much attention was focused on the purge of voters from the rolls in Brooklyn by officials holding patronage jobs in the City’s Board of Elections. It went often overlooked, but these patronage officials also purged Queens voters from the rolls, according to an investigation conducted by authorities with the New York State Attorney General’s Office, as noted in a report published by Gothamist. In addition to corruption in leadership, media attention began to focus on the appearance of conflicts of interest and misconduct in the Queens County court system. In 2011, the New York Times began to drop hints that there was trouble brewing in the Surrogate’s Court of Queens County, which administers the estates of individuals, who pass away intestate, or without a last will and testament. The same, top-ranking officials with close ties to the Queens Democratic Party county committee named in the 2011 New York Times exposé reappeared in a 2017 special report published by the Daily News. Questions were raised both each time about how Lois Rosenblatt, the Queens County Public Administrator, referred cases and how three attorneys, Gerard Sweeney, Michael Reich, and Frank Bolz, were assigned cases before the Surrogate’s Court or who were able to exert so much influence in Queens County politics. Extra scrutiny was applied on the three attorneys, who were reportedly able to gate-keep political primary races or were able to exercise discretion over which judicial candidates received support from the Queens Democratic Party county committee. These county officials allegedly owe all of their political loyalty to Crowley. They also allegedly owe their financial success to Crowley, too. The Queens Democratic Party county committee, for example, allowed Sweeney’s law firm to earn $30 million in legal fees from his Surrogate’s Court cases for 10 years beginning in 2006, according to the report published by the Daily News. After the 2017 Municipal election cycle, Crowley wrested control over the Council speaker race from lobbyists and installed a speaker of his own choosing — before any of the Municipal legislators, who would be casting their votes, had even been sworn into office for the legislative term that would be headed by the new Council speaker. Power-hungry and determined to use political appointments and the granting of official acts for his personal, political benefit, Crowley had succeed in patterning himself after his predecessors. Reports have been published that the activities of the Queens Democratic Party county committee have once again attracted the attention of anti-corruption investigators. In 2018, voters will have to decide if a change in the leadership of Queens Democrats must follow tradition — at the hands of Federal authorities, or in a primary election.